Despite being rated one of the UK’s only ‘Outstanding’ Trusts, they were struggling to recruit; a situation complicated by the acquisition at the end of 2014 of two neighbouring and underperforming hospitals in Slough and Ascot. WDAD Communications were appointed to create a distinctive look, feel and tone of voice to their recruitment communications material. The objective was to reinforce the message that it was now one combined and unified Trust, and to help improve its ability to recruit talented new hires. Also, crucially, it was designed to reflect their values (Committed to Excellence, Working Together, Facing the Future), so in addition to being a recruitment tool, the Employee Value Proposition we developed would also be an effective device for guiding and reinforcing behavioural values to drive staff engagement and retention. We developed the following EVP through the combined insights and outcomes from the Trust’s engagement surveys, our own Executive team interviews, site visits, 1-2-1 interviews with employees across different hospitals and teams, as well as 30 in-depth telephone interviews with employees at neighbouring/competitor Trusts: Excelling Together, Today and Tomorrow. This EVP statement provided a unifying statement for the three hospitals and a direct summation of the values, while adding in an attractive employment message. We rolled out a consistent and distinctive employer brand using a slightly retro photographic feel with high-contrast levels created using the technique called cross processing. As well as adjusting the contrast levels and focus, we also emphasised the three value colours wherever possible. 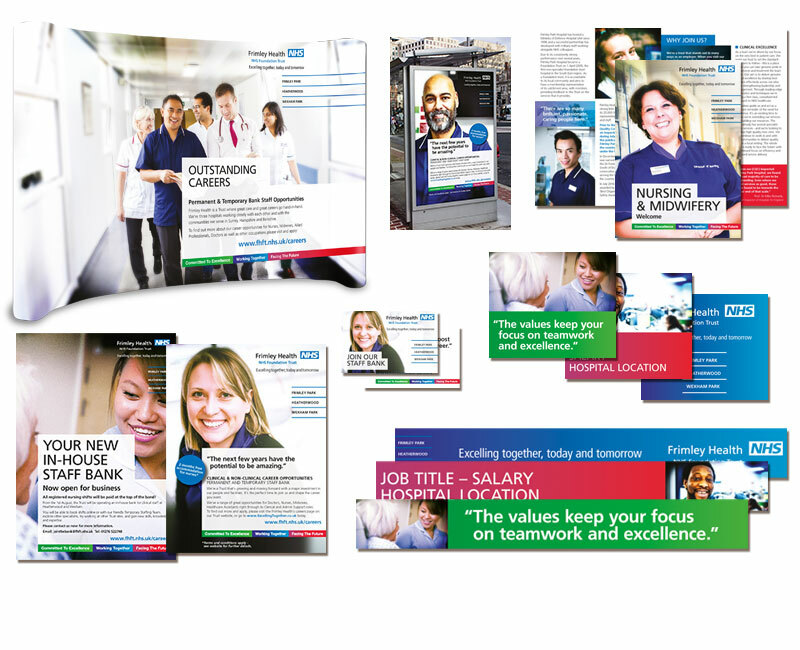 In addition, we created a bank of quote-based headlines – each related to a specific value – that were taken directly from interviews with Trust employees and are an authentic description of working life at Frimley Health. If not used as main headings, these quotes could also be used against the backdrop of one of our photo images – which has then had our value colour applied. We’ve prepared a bank of sample copy to use within recruitment communications. There is messaging specifically relevant to the Trust’s values as well as copy for specific audiences and uses. All these elements have been included in a comprehensive brand guidelines book, and whilst it’s early days (it launched internally in June 2016 and externally in August 2016) the roll out is on-going. And whilst this employer brand project has been taking place, the amazing transformation work undertaken by the HR and Senior Management teams over the last 12 months have seen some hugely significant and positive impacts at the two failing hospitals. In September, this work has been recognised at the CIPD People Management awards which saw the Trust win the Best Employee Engagement Initiative category as well as the accolade of being chosen as the overall Grand Prix winner. A fantastic achievement for all at Frimley Health!